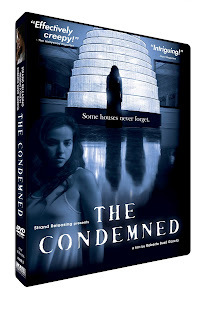 “The Condemned” (“Los condenados”) is a new film by Roberto Buso-Garcia from Puerto Rico, which seems like a somewhat minimalist combination of “The Shining” (April 14) and “Shutter Island”. Ana (Christina Rodlo) travels to the town of Rosales to restore her dying father’s family mansion itno a public museum to honor his anti-cancer work. Soon, she has to deal with hostile, impoverished townspeople (the mansion is an oasis in a decaying town). Then the house, where the father lies upstairs, starts acting haunted. The film has a particularly interesting visual effect with a ceiling to floor chandelier, which fairly shakes when the ghosts roam. The DVD will be available from Strand on May 7, 2013. I did the review from a private Vimeo screener. The film is in Spanish. I don't recall an important indie film from Puerto Rico before. Don’t confuse with a 2007 "thriller" film with the same (English) name.